Today is the birthday (1893) of James Francis (“Jimmy”) Durante, US singer, pianist, comedian, and actor. His distinctive clipped gravelly speech, New York accent, comic language-butchery, jazz-influenced songs, and prominent nose helped make him one of America’s most familiar and popular personalities of the 1920s through the 1970s. He often referred to his nose as the Schnozzola, and the word became his nickname. Durante was born on the Lower East Side of New York City. He was the youngest of four children born to Rosa (Lentino) and Bartolomeo Durante, both of whom were immigrants from Salerno in Italy. Bartolomeo was a barber. Young Jimmy served as an altar boy at Saint Malachy’s Roman Catholic Church, known as the Actor’s Chapel. Durante dropped out of school in seventh grade to become a full-time ragtime pianist. He first played with his cousin, whose name was also Jimmy Durante. It was a family act, but he proved to be too professional for his cousin. He continued working the city’s piano bar circuit and earned the nickname “Ragtime Jimmy”, before he joined one of the first recognizable jazz bands in New York, the Original New Orleans Jazz Band. Durante was the only member not from New Orleans. His routine of breaking into a song to deliver a joke, with band or orchestra chord punctuation after each line, became a Durante trademark. In 1920 the group was renamed Jimmy Durante’s Jazz Band. 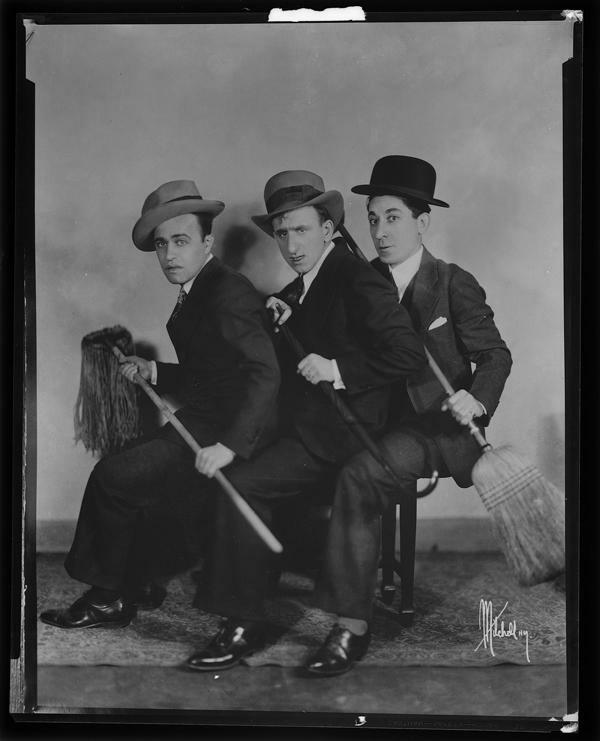 By the mid-1920s, Durante had become a vaudeville star and radio personality in a trio called Clayton, Jackson and Durante. Lou Clayton and Eddie Jackson, Durante’s closest friends, often reunited with Durante in subsequent years. Jackson and Durante appeared in the Cole Porter musical The New Yorkers, which opened on Broadway on December 8, 1930. Earlier that same year, the team appeared in the movie Roadhouse Nights, ostensibly based on Dashiell Hammett’s novel Red Harvest. By 1934, Durante had a major record hit with his own novelty composition, “Inka Dinka Doo”, with lyrics by Ben Ryan. It became his theme song for the rest of his life. A year later, Durante starred on Broadway in the Billy Rose stage musical Jumbo. A scene in which a police officer stopped Durante’s character—who was leading a live elephant across the stage—to ask, “What are you doing with that elephant?”, followed by Durante’s reply, “What elephant?”, was a regular show-stopper. This comedy bit likely contributed to the popularity of the idiom the elephant in the room. Durante also appeared on Broadway in Show Girl (1929), Strike Me Pink (1934) and Red, Hot and Blue (1936). During the early 1930s, Durante alternated between Hollywood and Broadway. His early motion pictures included an original Rodgers & Hart musical The Phantom President (1932), which featured Durante singing the self-referential Schnozzola. He was initially paired with silent film legend Buster Keaton in a series of three popular comedies for Metro-Goldwyn-Mayer, Speak Easily (1932), The Passionate Plumber (1932), and What! No Beer? (1933), which were financial hits and a career springboard for the distinctive newcomer. However, Keaton’s vociferous dissatisfaction with constraints the studio had placed upon him, his perceived incompatibility with Durante’s broad chatty humor, exacerbated by his alcoholism, led the studio to end the series. Durante went on to appear in The Wet Parade (1932), Broadway to Hollywood (1933), The Man Who Came to Dinner (1942, playing Banjo, a character based on Harpo Marx), Ziegfeld Follies (1946), Billy Rose’s Jumbo (1962, based on the 1935 musical), and It’s a Mad, Mad, Mad, Mad World (1963). In 1934, he starred in Hollywood Party, where he dreams he is ‘Schnarzan’, a parody of ‘Tarzan’ who was popular at the time due to the Johnny Weissmuller films. On September 10, 1933, Durante appeared on Eddie Cantor’s NBC radio show, The Chase and Sanborn Hour, continuing until November 12 of that year. When Cantor left the show, Durante took over as its star from April 22 to September 30, 1934. He then moved on to The Jumbo Fire Chief Program (1935–36). Durante teamed with Garry Moore for The Durante-Moore Show in 1943. Durante’s comic chemistry with the young, brushcut Moore brought Durante an even larger audience. “Dat’s my boy dat said dat!” became an instant catchphrase, which would later inspire the cartoon Augie Doggie and Doggie Daddy. The duo was one of the nation’s favorites for the rest of the decade. Their Armed Forces Radio Network Command Performance with Frank Sinatra remains a favorite of radio-show collectors today. 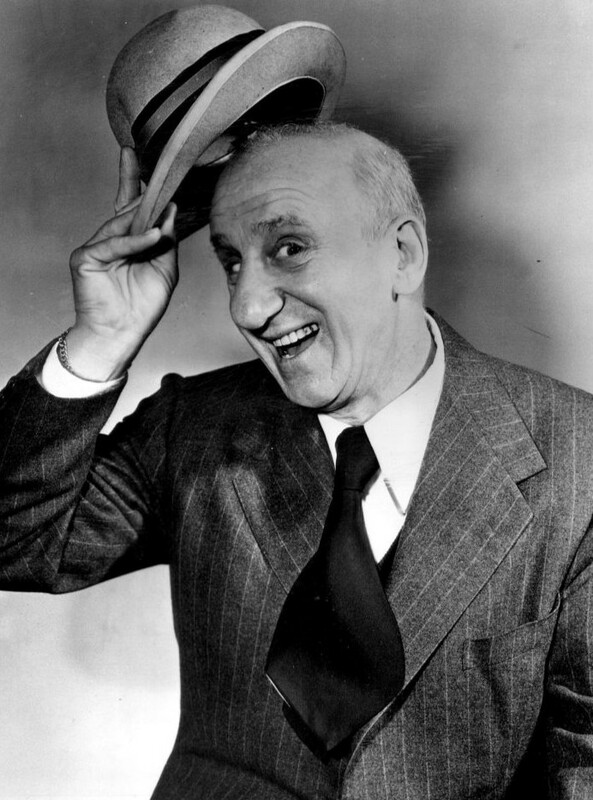 Moore left the duo in mid-1947, and the program returned October 1, 1947 as The Jimmy Durante Show. Durante continued the show for three more years, and featured a reunion of Clayton, Jackson and Durante on his April 21, 1948 broadcast. Durante made his television debut on November 1, 1950 (although he kept a presence in radio, as a frequent guest on Tallulah Bankhead’s two-year NBC comedy-variety show The Big Show). 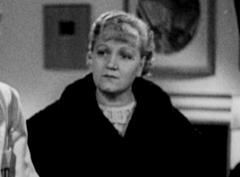 Durante was one of the cast on the show’s premiere November 5, 1950. The rest of the cast included humorist Fred Allen, singers Mindy Carson and Frankie Laine, stage musical performer Ethel Merman, actors Jose Ferrer and Paul Lukas, and comic-singer Danny Thomas (about to become a major television star in his own right). A highlight of the show was Durante and Thomas, whose own nose rivaled Durante’s, in a routine in which Durante accused Thomas of stealing his nose. “Stay outta dis, No-Nose!” Durante barked at Bankhead to a big laugh. From 1950 to 1951, Durante was one of four alternating hosts on NBC’s comedy-variety series Four Star Revue. He alternated Wednesdays with Danny Thomas (now a headliner), Jack Carson, and Ed Wynn. 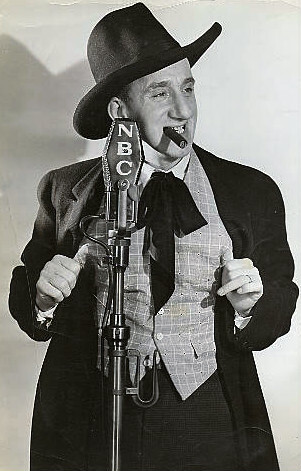 Durante had a half-hour variety show – The Jimmy Durante Show – on NBC from October 2, 1954, to June 23, 1956. Beginning in the early 1950s, Durante teamed with sidekick Sonny King, a collaboration that continued until Durante’s death. He was often seen regularly in Las Vegas after Sunday Mass outside of the Guardian Angel Cathedral standing next to the priest and greeting the people as they left Mass. 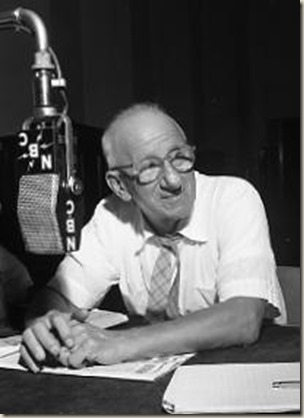 Durante’s radio show was bracketed with two trademarks: “Inka Dinka Doo” as his opening theme, and the invariable signoff that became another familiar national catchphrase: “Good night, Mrs. Calabash, wherever you are.” For years Durante preferred to keep the mystery alive. One theory was that it referred to the owner of a restaurant in Calabash, North Carolina, where Durante and his troupe had stopped to eat. He was so taken by the food, the service, and the chitchat he told the owner that he would make her famous. Since he did not know her name, he referred to her as “Mrs. Calabash”. Another idea was that it was a personal salute to his deceased first wife, Jeanne (Olsen) Durante, who died in 1943. “Calabash” might be a mangle of Calabasas, the California city where they made their home during the last years of her life. His friend and co-star, Candy Candido, (in an interview with Chuck Shaden’s “Speaking of Radio” in 1988), reported that he met the actual woman in Chicago when traveling with Durante, but was sworn to keep the secret. Alternatively, Jimmy’s friend and radio producer, Phil Cohan revealed to Chuck Shaden’s Speaking of Radio interview in 1988 that it was a fabrication. Needing a closing to his show, the writers tossed around several names settling on Cohan’s calabash pipe as the best-sounding moniker. 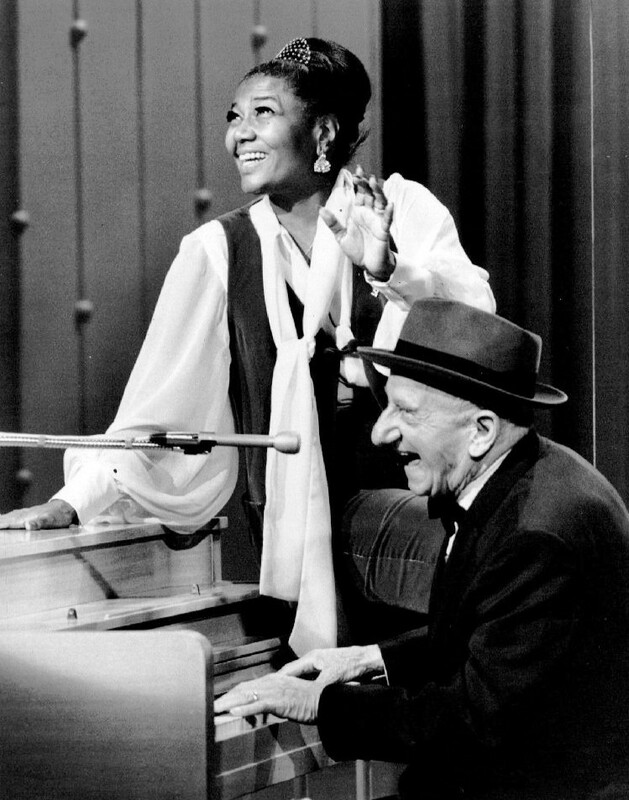 At a National Press Club meeting in 1966 (broadcast on NBC’s Monitor program), Durante finally revealed that it was indeed a tribute to his wife. 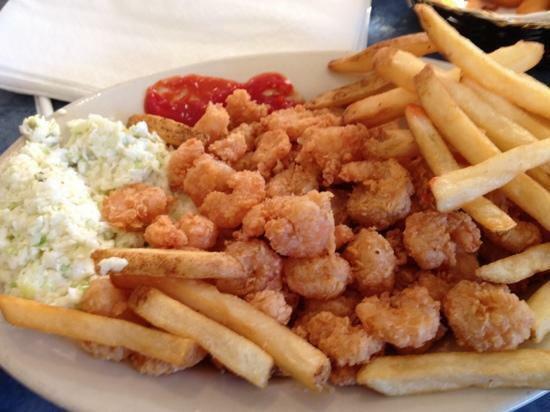 While driving across the country, they stopped in Calabash, whose food they liked, but she also loved the name. “Mrs. Calabash” became his pet name for her, and he signed off his radio program with “Good night, Mrs. Calabash.” He added “wherever you are” after the first year. Calabash, North Carolina, was named after the gourds that grew in the region, which were used for drinking well water. Since the 1930s, Calabash has been known for its distinctive style of fried seafood, which has come to be known as “Calabash Style” Calabash style buffets are common in many eastern Carolina coastal towns. I lived on the coast of North Carolina for a year in the late 1970s and never tired of fish buffets. You may tire, however, if you are a longtime reader of my endless mantra: “You have to go there to appreciate the food.” I’ll give you a recipe anyway. It looks like the recipe for English deep fried fish, but if you go to Calabash you’ll know the difference. Heat oil in a deep fryer to 375˚F/190˚C. Beat together the eggs and milk in a large mixing bowl. Sift in the flour, a little at a time, and beat until smooth. Season to taste with salt and pepper. Let rest for a few minutes while the oil is heating. Dip the shrimp in batter, in batches, making sure that each shrimp is well coated. Fry in the hot oil, being careful not to fry too many at once in order to avoid cooling the oil excessively at the beginning of frying. Deep fry the shrimp, turning them periodically to make sure that they are golden on all sides, and, when crisp, remove with a slotted spoon and drain briefly on a wire rack. Serve with cole slaw, fried potatoes, and the dipping sauce of your choice. Tomato and horseradish is a common favorite along the coast.